So many different editions of this book out there but this is the one I purchased for my reread as my original copy is in a box somewhere at my parents. Not my favorite cover but still lovely nonetheless. Thanks so everyone taking part in the #letsTAKaboutit readalong I'm hosting with @jessicamapreviews... now on to Desperation! 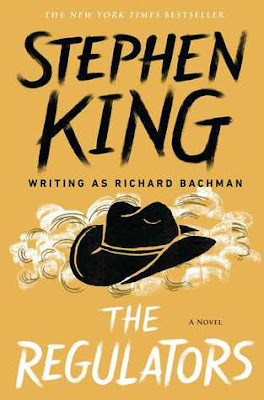 The battle against evil has begun in this “devishly entertaining” (Publishers Weekly) story of a suburban neighborhood in the grip of surreal terror—a #1 national bestseller from Stephen King writing as Richard Bachman. Peaceful suburbia on Poplar Street in Wentworth, Ohio, takes a turn for the ugly when four vans containing armed “regulators” terrorize the street’s residents, cold-bloodedly killing anyone foolish enough to step outside their homes. Houses mysteriously transform into log cabins and the street now ends in what looks like a child’s hand-drawn western landscape. Masterminding this sudden onslaught is the evil creature, Tak, who has taken over the body of an autistic eight-year-old boy, Seth Garin. 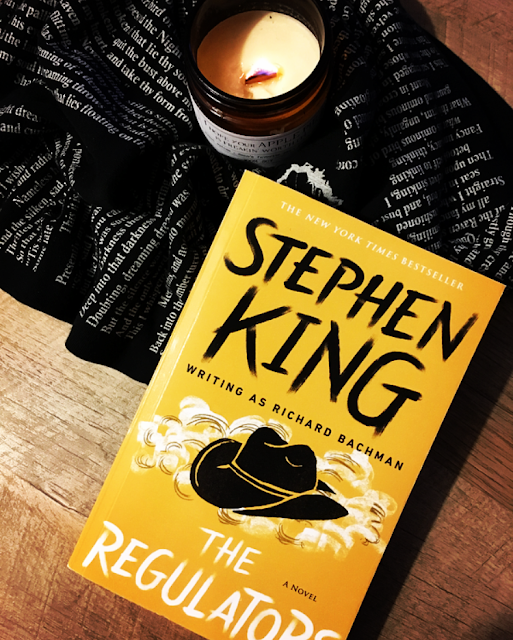 Reading the Regulators after 20 years was like reverting back to my childhood. I absolutely remember why I adore this book. Things get crazy and you're left wondering what in the hell is actually happening and things start happening right at the get go. As I was reading, I was like yep, yep, yep.. I remember that and THAT but what about THIS??? Oh yeah, that's Desperation! Haha! I do like it when books incorporate different types of reads such as articles, journal entries, drawings, etc and this one definitely does that, giving us a bigger picture of how everything evolves. I feel like King/Bachman has a tendency to like things that lay dormant and come out with a vengeance. It's not until the last few scenes where things go up a factor of craziness and we get an idea of what finally is going on and why that it really pulls me in and ups my feelings for the book. Poor Seth. Poor Audrey - POOR EVERYONE! And that final page... Love. Now on to read Desperation and see if I still feel the same about that one too. Either way, I'm so happy to be revisiting this completely insane world. It’s so hard for me to really review books like this that I’ve read multiple times without spoiling anything. THE REGULATORS is the sister book to DESPERATION. One written as Bachman and the other as King. There seems to be a clear division between readers – you either like one or the other more. I have always been on the side of THE REGULATORS and I still am after this reread. The small suburban neighborhood on Poplar Street is about to go from the perfect summer day to a bloody nightmare. Upon the arrival of some strange looking vans, like something out of a sci-fi novel, an onslaught of shotgun fire rips through the neighborhood, and anyone that steps outside. What I love about this book is that this action begins immediately. After the first chapter the madness begins and doesn’t let up. The town slowly begins to transform from the suburban homes to cabins and the residents find themselves in an old western landscape, with terrifying creatures that almost look like a child’s creation. What is causing all the violence? Why their street? Meanwhile, in the Wyler home of Poplar Street, Audrey is desperately fighting for her life against an evil entity that has taken over her sweet nephew, Seth. Tak will always remain one of my favorite villains. An entity that attached itself to the young Autistic boy and proceeds to feed off of and weaken those around him. I think King did a really good job depicting Autism and how Seth interacts with those around him and even with Tak. Just like the cover of my beat up paperback says, “Lean and Mean”. 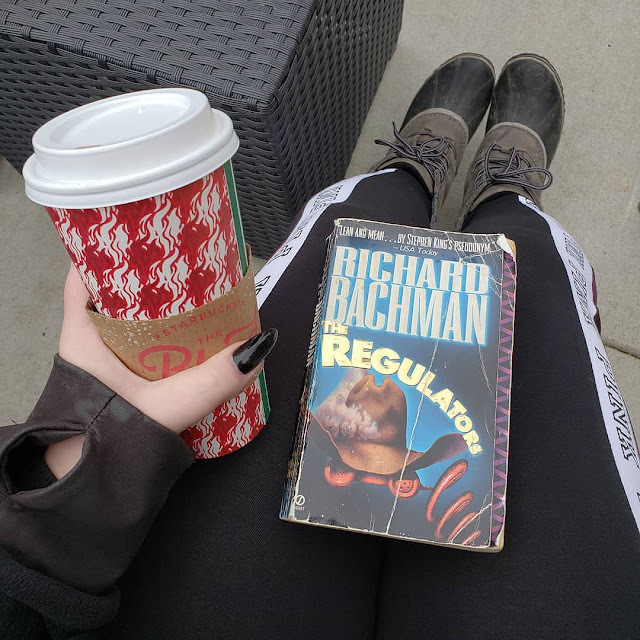 There’s something about the Bachman books that I’m drawn to and I think it’s how bleak the stories are, they have a darker overall tone to them. This is perfectly depicted throughout THE REGULATORS. I’m anxious to start up DESPERATION – it’s been over a decade since I last read it. Guess we’ll see how I feel about it this time around!